The new remastering process, originally used for the American Epic documentary, continues to be used for the Blues Images CD releases. This year’s CD includes new remasterings of Charley Patton’s “Oh Death” and “Troubled ‘Bout My Mother,” as well as rare tracks by Otto Virgial (“Got the Blues About Rome” / “Seven Year Itch”). The remastered dynamic vocals of Lottie Kimbrough on “Don’t Speak To Me” and Memphis Minnie on “Ma Rainey” reveal two standout performances. The artwork included in the calendar pairs closely with the recordings, reproduced from a rescued collection of original promotional advertisements from Paramount Records’ hometown— Port Washington, Wisconsin. Each calendar month includes photographs and advertisements reproduced from the originals, along with notable birth and death dates for blues masters you’ll hear on this compilation and past Blues Images CDs. 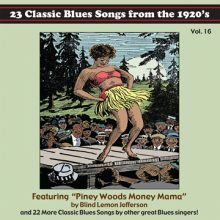 This entry was posted in Blues and tagged 23 Classic Blues Songs from the 1920's Vol. 16, Blues, Blues Images, Various Artists, William Vanden Dries by aaamc. Bookmark the permalink.